Skye, an eight-year-old Clydesdale mare, was impaled with a two-foot stake while in a paddock in the Whicham Valley in south Cumbria. She's now recovering from surgery at a vets in Penrith and Tim Backshall has been along to meet Skye and her owner Annie Rose. Anyone with information about the attack should contact Cumbria Police on 101 or the RSPCA's cruelty hotline on 0300 1234999. 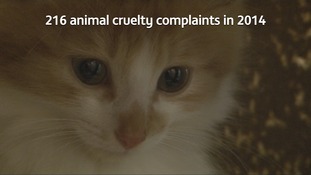 RSPCA statistics show the number of animal cruelty complaints increased for the second year running. But fewer people were convicted. Animal cruelty complaints investigated by the RSPCA in Cumbria have risen for the second year in a row. But the figures for 2014 also show that the number of convictions has fallen. The charity says this is due to an increase in the number of owners accepting advice to resolve welfare issues. CCTV footage shows the man, from Keswick, punching and kicking the dog. The RSPCA has called the footage "horrible to watch". There were 27 convictions for animal cruelty in Cumbria last year, down from 35 in 2012. Poppet the horse was rescued at the Appleby Fair. Members of the public noticed her and contacted the RSPCA. She was dehydrated and close to death but has since made a good recovery. Her owner was fined more than £2,000. Will Lamping, an RSPCA inspector, told ITV Border how some people don't respect animals. Four dogs rescued from baking hot car at Appleby Horse Fair. Four collie dogs have had to be rescued from a car at the Appleby Horse Fair. The dogs were found in the back of a pick up truck, where the temperature measured 90 degrees Fahrenheit. The RSPCA and Cumbria Police attended the scene on Garths Head Road in Appleby where they took the back off the car so the collies could be released. The four dogs were taken to a nearby police station to be given water. RSPCA centres in Cumbria have reached crisis levels, due to the number of cats needing re-homed. The same can't be said across the border, but the Scottish SPCA do still need homes for unwanted cats. In one case, at the Dunragit Centre in Stranraer, a cat has been waiting a year to find a new home. Animal charities in the regions are warning that the number of cats and kittens being abandoned is reaching crisis point and healthy animals may have to be destroyed unless more homes can be found. The RSPCA says that all of its centres in Cumbria are full, and in some areas it is having to pay for animals to be housed in private catteries - with the situation near breaking point. Alan Green is the chairman of the Westmorland branch of the RSPCA. It's got to crisis point. The RSPCA in the north-west now have 250 cats in private boarding kennels- that's not counting all the RSPCA animal homes, which are all full. "As we re-home them, they fill us up straight away. People don't realise how much a pet costs, even a cat. If every female cat was neutered then we wouldn't have this problem. "A female cat can, in theory, have up to 12 kittens in a year. Those kittens can then breed within six months so the problem just escalates. "When every place is full, you then have to decide what to do with the cats. "If people won't re-home them, then you have to come to the awful decision to put some to sleep. It's a last resort but sometimes you have no choice." A list of RSPCA and SSPCA centres in Cumbria, the Scottish Borders and Dumfries and Galloway.